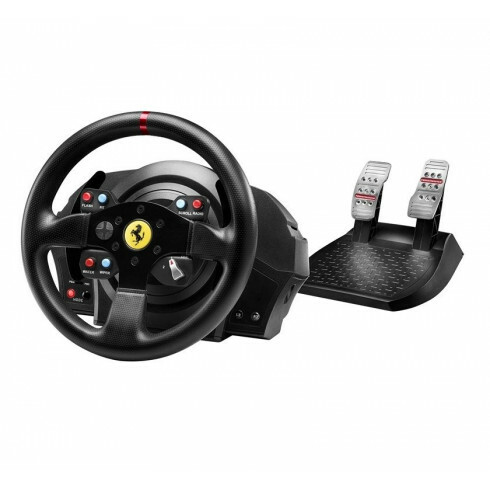 Thrustmaster T300 Ferrari GTE Racing Wheel for PC is inspired by the benchmark Ferrari GT race car! The T300 Ferrari GTE conveys the same values as the illustrious Ferrari 458 Challenge wheel on which it is based, namely performance, character and precision: features which will help users perfect their racing skills and shatter lap times. The T300 Ferrari GTE is a 7:10 scale replica of the wheel on the actual distinguished race car, which graces racing circuits around the world. The T300 Ferrari GTE is a racing simulator for PC. It combines the power provided by a brushless industrial Force Feedback motor (with frictionless action) with a new 1080° dual-belt system, for incredibly responsive, realistic force effects with super-smooth performance. This fine-tuned attention to detail is also evident in the pedal set (with its adjustable metal pedals featuring 6 different possible positions per pedal), in the wheel’s angle of rotation (which can be adjusted from 270° to 1080°) and even in its steering axis – which features H.E.A.R.T (HallEffect AccuRate Technology), incorporating a contactless magnetic sensor providing 16-bit resolution, for 65,536 values on the wheel’s steering. Both real and virtual racers know full well that effective driving performance is made even better when you’ve got your hands on equipment with true potential, like a Playseat® racing chair and a Thrustmaster steering wheel. The T300 Ferrari GTE – designed in the image of the Ferrari 458 Challenge race car – lets gamers master the most hazardous racing circuits, with absolutely precise lines. It features a versatile, detachable wheel 28 cm / 11 inches in diameter, with reinforced textured rubber cladding on the wheel’s entire circumference. With 6 action buttons, 1 D-pad, 1 manettino dial and 2 large sequential metal paddle shifters which turn along with the wheel, the driver has all of the tools required for professional-level performance. The T300 Ferrari GTE’s base also features 2 other action buttons, an internal memory an upgradable firmware thanks to the wheel’s PC compatibility (allowing users to always have access to the latest improvements).